This area of the Georgia wiregrass country is located where the Oconee and Ocmulgee rivers meet to form the Altamaha. It was settled in the early 19th century by a large migration of Scots from the Wilmington region of North Carolina. According to Sid Johnson’s book Longpondium, this migration pattern began in the late 1700’s, accelerated around 1810-1815 and became quite large in the 1820’s and 30’s. The Scots were attracted by the the wiregrass pasturage, the prolific pine forests and and the fertile soil. This ecosystem in combination with the Georgia land distribution by headright and lotteries attracted large numbers of the hardy Scots after the Revolutionary War. 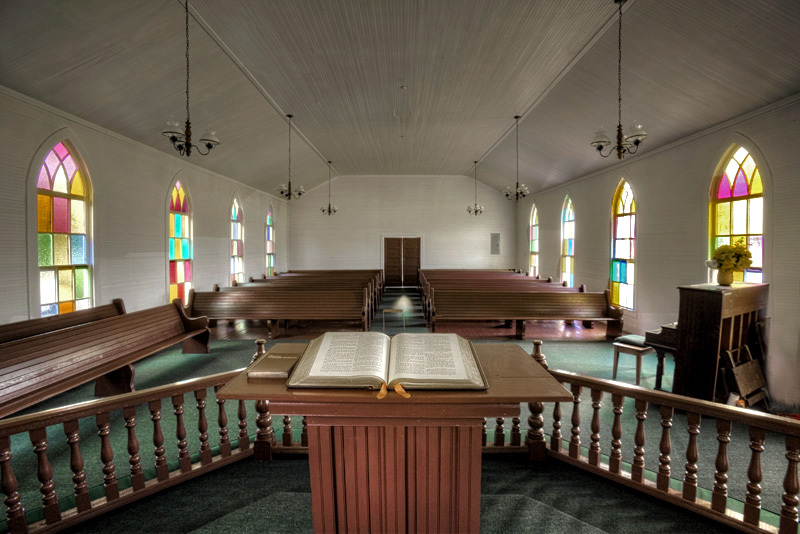 Even though this sanctuary was raised in 1901, it was designed, inside and out, to replicate the traditional rural churches common throughout the 19th century. Rather than adopt the more flamboyant Victorian and Carpenter Gothic styles that were coming onto vogue at the dawn of the 20th century, Long Pond is a center steeple, rectangular, wood framed structure with a trussed roof, “cathedral ceiling” and extremely plain interior. This church is more of the mid-1850’s style than the 1900’s. This view of the north wall of Long Pond focuses on the most decorative elements found within this sanctuary… its large, gothic windows containing random pastel glass panes. They each are made up of matching wood frames holding double hung windows filled with colored glass. These were manufactured in far away factories as standard units and bought in bulk by congregations who then placed them in the walls of their new sanctuaries. They were colorful, quickly installed and relatively inexpensive. 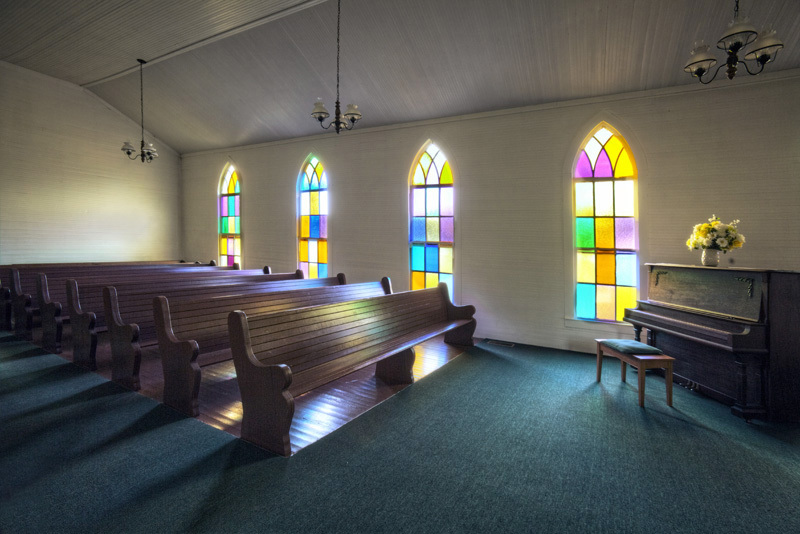 For most of the 18th/19th century, stained glass/custom windows or frames with clear glass panes were the only choices. Some sects, such as the Primitive Baptists, eschewed such ostentation and would only use wood shuttered windows to prove their churches “purity”. The times/products they were a changin’. 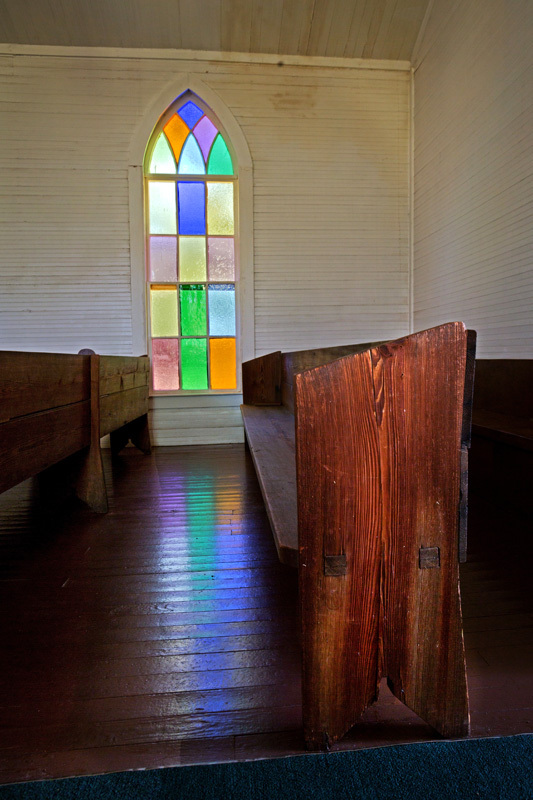 Windows such as these at Long Pond became popular and common in churches throughout Georgia after 1900. 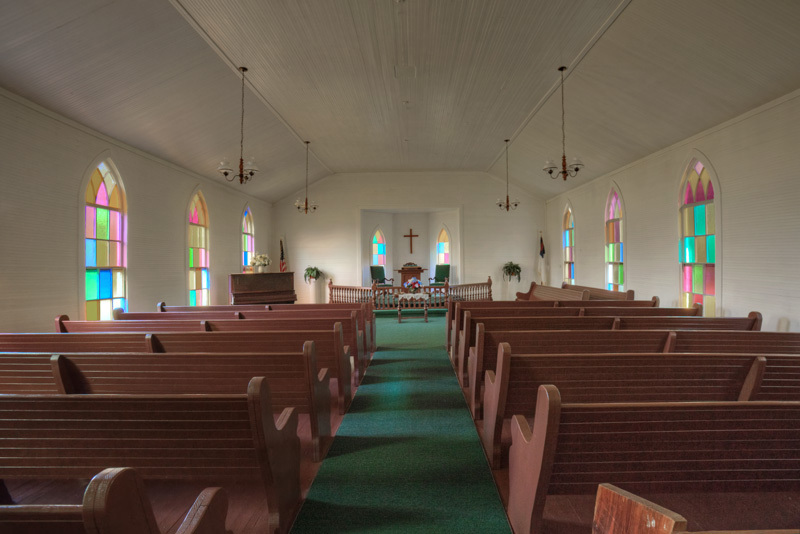 This view exhibits how much had changed by 1900 since the early, 19th century days at rural churches. Most items had been hand-made in the old days…if not on sight then in small shops nearby run by local craftsmen. Everything seen in this meetinghouse was manufactured off site, then bought and installed by the contractor in charge of building the church. The pulpit, chancel balustrade, handsome pews, lighting fixtures, hardware, windows and doors were all manufactured for sale into the very active church building market. A new century with new ways had dawned. This interesting shot highlights the comments from the preceding photo where all the formerly hand made furnishings were now bought from manufacturers to the church market. These original pews were used in the original Long Pond sanctuary but saved as relics for display at the new 1901 building. Note the crudeness of the flat board design, the mortise and tenon joining and irregular fit and finish of these old pews. We find them beautiful examples of the old methods and ways. This is a view of the present communion table, chancel, balustrade, pulpit and apse at Long Pond. 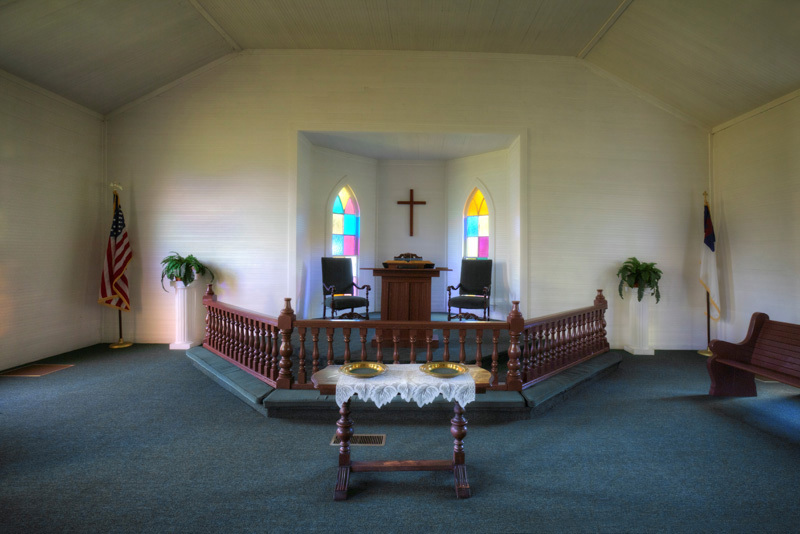 The sanctuary still provides a welcoming church-home for the congregation in this community. Dead River Cemetery dates from 1802 and is located about two miles from the church. It was was the original cemetery and church site in the area until the church moved to Long Pond in 1877. 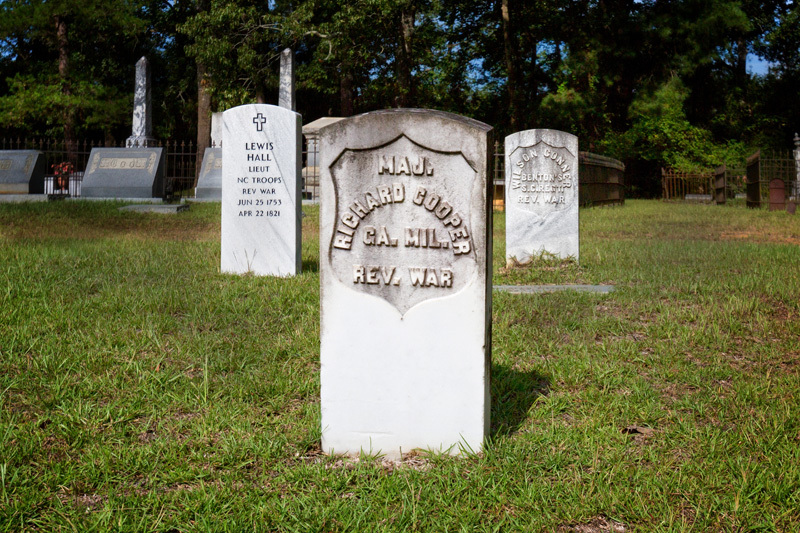 The Dead River cemetery contains some of the most prominent early citizens of Montgomery County. 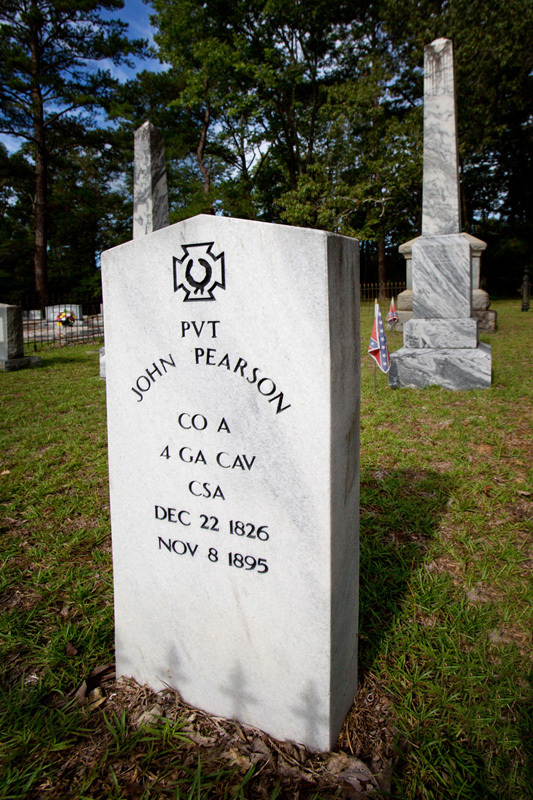 Here lies John Pearson, Co A 4th Ga Cavalry. Next to him is his wife Anne Ryals Pearson who died in 1899. The Ryals and the Pearsons were prominent families here in the wiregrass country.